"I'm getting really freaked out, Dave," Night Owl said. I chortled as I inspected the cave we had crawled into after a climb up a hillside, even as I stuck my GPS (a Global Positioning System instrument, which determines geographic location with high precision) out our lofty perch to get a position fix from a satellite. "No, I mean it," Night Owl said. "Someone's buried here." According to our topographic map, there were ruins up this hill east of Ryan Campground (one of nine campgrounds in Joshua Tree National Park, one hundred forty miles east of Los Angeles), where Night Owl, my family and I had encamped, waiting for others from the DesertUSA forums to rally. Between the campground and the ruins, a broken-line square and the letters "CEM" denoted a cemetery. My wife, my son Alex and Night Owl had hiked east from our campsite, toward what appeared to be adobe ruins. The weather was perfect for hiking, cool enough to inspire us to keep moving. We had worked through black bush, creosote and yucca, through the twisted dignity of Joshua trees, around looming piles of boulders, as we followed a trail that passed a fallen gate, then finally through the entrance of an adobe building which sits atop a rise. High walls and elongated windows made me think of a cathedral. 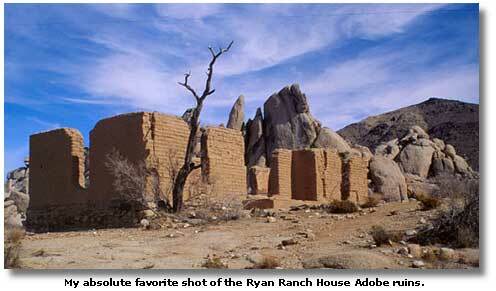 This is all that is left of the Ryan's ranch house, destroyed by vandals in 1978. The mountain behind the ruins is named for the Ryan brothers. 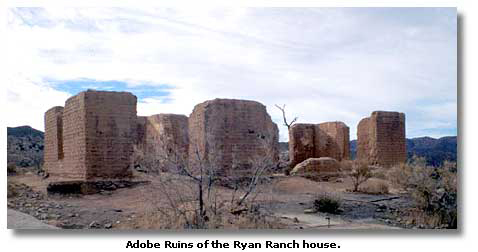 From the windows of the structure, we could see more ruins to the south, more adobe walls, then up the hill, modern structures, also abandoned. I hadn't seen anything even vaguely looking like a graveyard. Night Owl claimed he'd spotted a stone wall far up the side of Ryan Mountain, and we all followed his charge. Night Owl looked around the flat above the ragged teeth of stone, and frowned. "I thought for sure this was a man-made wall." As I looked back the way we'd come, through black bush and creosote, I could just see my wife and son. Alex had finally mutinied about a quarter mile back. 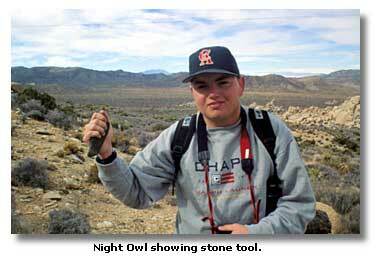 "Well, at least we found that tool," Night Owl offered. "Indians were up here for some reason." I nodded, too busy sucking air to say anything more. Night Owl had found a stone ax, or chopper, smooth where hands had held it many times, the end chipped. He had returned it meticulously to where he'd found it. The drum solo my heart had been playing tapered off, and I started suspecting I might survive this climb. Presently, I realized we had both taken up positions, like sentinels on these ramparts, standing silently, looking across the vast Joshua tree forest stretching away below us. I looked back toward camp. Between us and it was a pump house and a large metal water tank, circa 1960's. Beyond that, closer to the adobe ruins, another pump house, a fallen windmill tower, all now worthless. An earthquake in 1972 crushed the desert well here, cutting the water source off forever. With my binoculars I glassed the area around the adobe structure. "Where's the cemetery?" I asked out loud. "Bet'cha its off to the north of the ranch house," Night Owl offered. We got back to my family, then worked our way down. We discovered a flat of boulders near the ranch house, where someone in historic times had made extensive designs with small rocks: lizards, coyotes, tarantulas, yin-yang signs, peace signs, pentagrams and names. Some of them are impressive. No one seems to know anything about these symbols. Still, no cemetery. Finally we came down from the bluff in amongst some very large boulders outside a gate entrance. "It should be right here," I said, looking around the boulders standing around us. "You mean there!" my wife said. "Where?" She pointed at my feet. Bread-loaf size rocks made a square, to the right of my boot. Among the towering boulders were five squares of stone, no more than five feet long. No iron gate, no chiseled headstones. This was a pioneers' graveyard, where only the danger of you being dug up by coyotes made them bury you deep. The prayers over you done, the others got back to the business of keeping themselves alive. "Dates!" my wife said. A huge split boulder, with two small graves tucked into the crevices, had over each of them "1897," neatly painted in black. Children's' graves, or babies, maybe not even named yet, that rated the year being fixed above them. The lonely truth of a graveyard seems doubly poignant in the desert. In the desert you ponder life, the nature of time and how much of it you've got, and what it all means in the grand scheme of things. The grave pretty much sums up the answers. Walking around this boulder, back to the graves we had already found, I spotted something etched into another, even taller, stand of boulders. "It's a fish," Night Owl said. "The real thing? A petroglyph?" "We both know what a petroglyph [an image the Indians carved or pecked into stone] looks like," Night Owl answered blandly. "But, what's it doing here?" I looked around, then up the boulders. Above us, cutting through the boulders, was a natural tunnel. I crawled up into the split, into a roomy cave with a flat sandy floor, and another tunnel going to the other side of the rock pile. Out the other way, a grand view of the campgrounds. I stuck my GPS out. The GPS screen gave me something I rarely see, the indication that no satellites were available. I moved it around, looked up to see if boulders above blocked a clear shot. The indicator persisted. "Someone's buried here," said Night Owl. I looked back at Night Owl as his blunt declaration sank in. "Where?" I asked. He nodded toward the tunnel, yet made no move toward it. I sighed, got on all fours and crawled into the passageway, then out the other side. A small plateau here with brush and stone gave me a view back towards the ruins. Still, no sign of a grave. 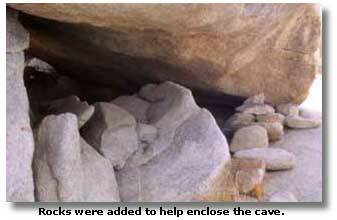 On the way back, I noted the bread-loaf size rocks and the softness of the sand floor in the shaft. "Yeah, but, did the sand feel like it had any depth?" I frowned at Night Owl. "You mean the sand I just scrambled across on all fours?" Night Owl looked at me quizzically. "Well, yeah." For some reason, it seemed prudent to leave. We found my family poking around the far side of these boulders. More graves are tucked against them, other graves are out in the open. We discovered another large boulder that serves as a headstone for two graves partially obscured by brush, with names and dates neatly painted above them: "James, 1893", then "Lopes, 1894". According to Robert Cates' book, "Joshua Tree National Park: A Visitor's Guide" Frank L. James was a prospector murdered for his gold claim. Lopes may have been a victim of a brawl where five men died. We headed back toward camp. We discovered still more graves. Another pile of boulders, even closer to the campground, was riddled with dozens of morteros and obvious cave dwellings. I marked them with my GPS. "How's it doing?" Night Owl asked. "Locked right on," I said. The graves are stark evidence of how the pioneering human population of this region failed to survive. Now the coyote population is at risk. As the park rangers will tell you, it is a bad idea to feed the coyotes! 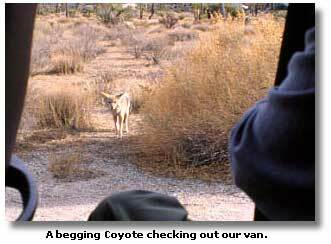 Having come in from the West Entrance of Joshua Tree National Park, you're driving along the road, your passengers gawking at the eerie, otherworldly landscape of twisted Joshua trees and piles of boulders, when suddenly, someone cries out, "There's a coyote!" You slow down for a closer look. Joshua Tree has organized coyotes like Yosemite has begging bears. According to the park rangers, during the busy time of the season, a group of coyotes has conceived a plan. One will skirt Park Boulevard's edges, showing itself to the passing motorist, slowing traffic, and shortly, other coyotes will come up to the slowing or stopped vehicles and petition for food. The coyote is considered the most adaptive of the desert animals, constantly finding new ways of surviving. This time, however, the animals have outsmarted themselves because they whelp pups that learn how to beg and not how to hunt. When the slow season comes, the hot months of summer, the pups don't know how to survive. They starve to death. Momentary entertainment by the side of the road causes traffic congestion, puts drivers and passengers at risk, and results in tragedy long after the visitors have left. If you go to Joshua National Park, explore the ruins and graves, but do not feed the coyotes. If you camp in the park, you will know the coyotes more intimately than you can ever hope for, when the Choir of the Desert sings its eerie hymns in the night.